It was another chilly day with suspended disbelief that Spring is actually here. The birds are still chirping but the snow is still here for now! Above are some of our repurposed containers providing some bright coloration on this grey day. 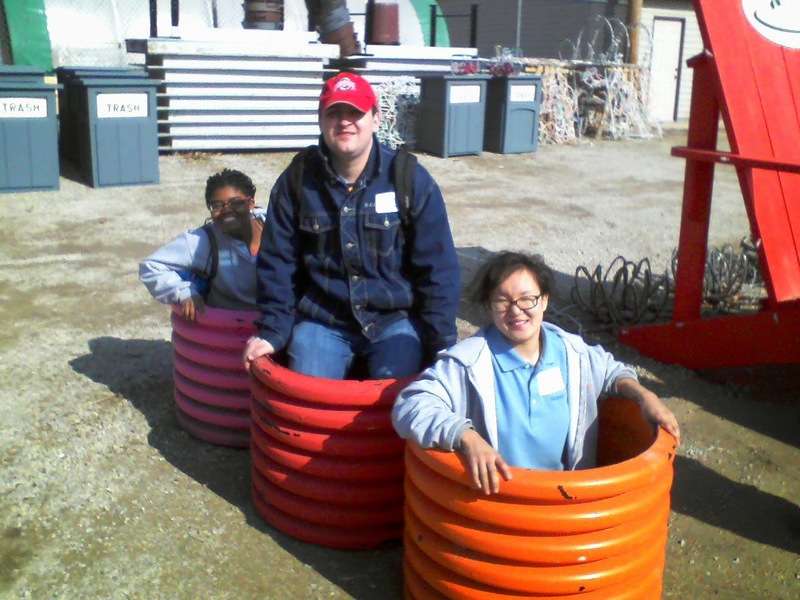 Below are three Shepherds College (Union Grove, WI) students last week enjoying these containers on a sunny day. The students visited last week and supplied pansies and petunias for the Spring Symposium and many were given to volunteers last night at our very successful Volunteer Soup Night. We had 80 people attend including a dozen or so new volunteers. It was a fun gathering and a did a presentation talking about volunteer opportunities, 2015 plans and I also promoted visitation to Anderson Japanese Gardens (Rockford, IL), the Ball Seed Trial Gardens (West Chicago, IL), the Paine Art Center and Gardens (Oshkosh, WI) and the Green Bay Botanical Gardens. 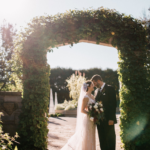 We had some action both out in the gardens and at the Horticulture Center today. Urban was out pruning for a couple of hours and Pat M. worked on some projects at the Horticulture Center and out in the gardens. Gena and Myrt (see photo at the bottom) did a nice job painting various objects with their 2015 colors and Pat R. and Kay (photo also at the bottom) continued with progress with assembling handouts, cutting up fliers and more processing of our Spring Plant Sale tags. That sale isn’t far away and will again have a wide range of perennials, shrubs, herbs and vegetables. This is an important fundraiser for the gardens so spread the word (and/or disperse some posters!). Bill O. came in to work on some projects in the afternoon and we also saw Kris K., Rollie and Dr. Yahr today. The bagged compost is here and ready to be sold starting Saturday, April 4th (8 am until 12 noon) at the Horticulture Center. Delivery by Leo (Midwest Trading) and unloading by our Larry wasn’t much fun on that snowy day but everything went well. Kay (left) and Pat R.